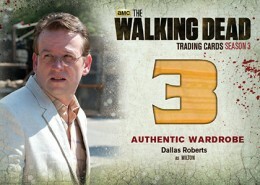 2014 Cryptozoic Walking Dead Season 3 Part 2 trading cards round out the story started in Part 1. 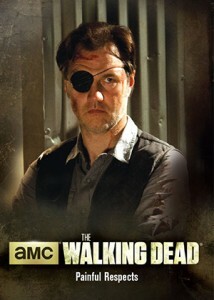 While the first set focused on life at the prison, Part 2 switches to Woodbury and its citizens. It's a unique approach that not only gives Walking Dead fans more to collect, but allows Cryptozoic to use different perspectives for each release. And while a lot of the attention goes to the Governor, there is some overlap where he crosses pass with Rick and his group. 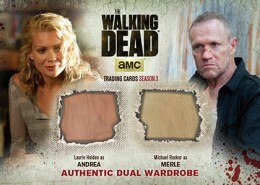 Like the company's other sets based on the top-rated show, boxes have both an autograph and a Wardrobe Card. Among those committed to signing for the set are Andrew Lincoln (Rick Grimes), Danai Gurira (Michonne) and Chad L. Coleman (Tyreese). Wardrobe cards have pieces of costumes embedded in them. 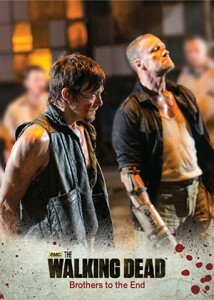 Both the main cast and zombie Walkers are included in the set. 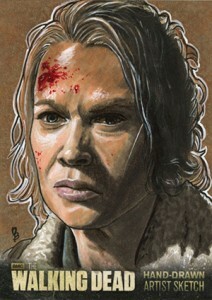 Some of the most valuable cards in Cryptozoic's Walking Dead line have been the sketch cards. They're inserted as a case hit, falling 1:288 packs. These feature likenesses of characters and Walkers out of the show rather than ones inspired by the comic. The 2014 Cryptozoic Walking Dead Season 3 Part 2 base set uses images from the show to recap key moments. 12 cards. 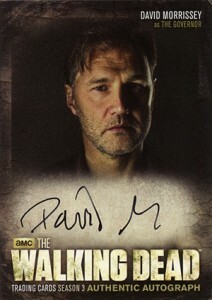 Combine with Autographed Wardrobe cards to fall one per box. Check out a full gallery. 38 cards. Inserted 1:24 packs. M-52 exclusive to binder and not in packs. W13-WG exclusive to Walgreens. W14-HT exclusive to Hot Topic.